Let’s face it weeknights are busy! By the time you get the kids off the bus, feed them a snack, go through their backpacks, help them with homework and do any extracurricular activities, it’s time for dinner! Who has time to prepare complex meals on a weeknight? Busy parents want hearty, homemade meals that don’t take long to prepare. Skip the convenience food and opt for easy 30 minute recipes instead! 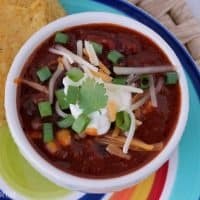 This 30 minute taco soup recipe is perfect for busy weeknights and as an added bonus it makes a big batch and freezes well! That means that not only will you be making dinner, but you’ll also get a few containers of soup for your freezer too. That means you’ll have lunch later! 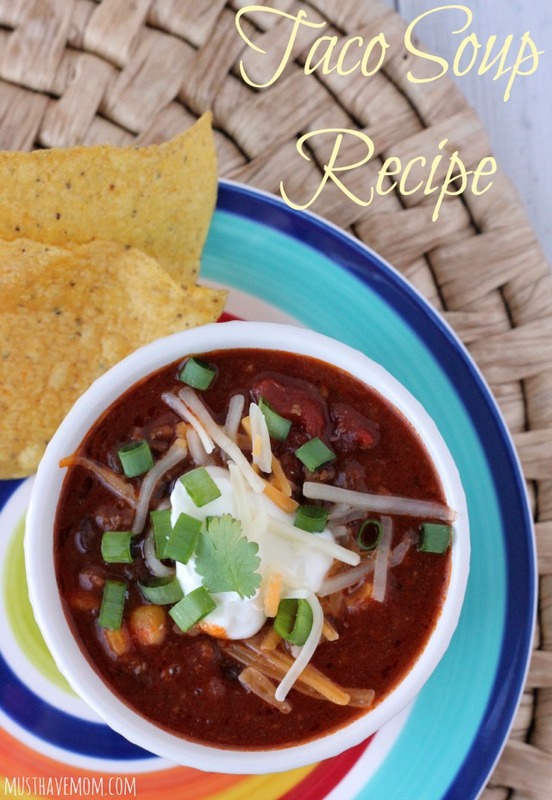 If you can brown beef and pour ingredients in a pot then you can make this taco soup recipe! It’s so incredibly easy and the flavor is complex and the soup is hearty. It is fantastic! 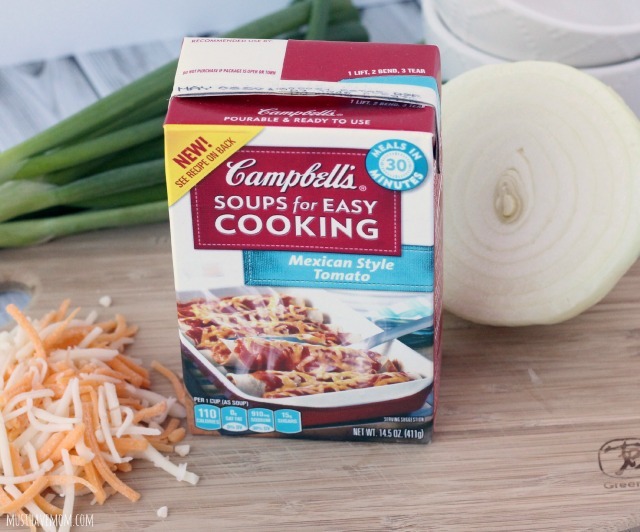 Campbell’s has a new line of Soups for Easy Cooking that make this recipe even easier! They come ready to cook with in a carton that you can pour. 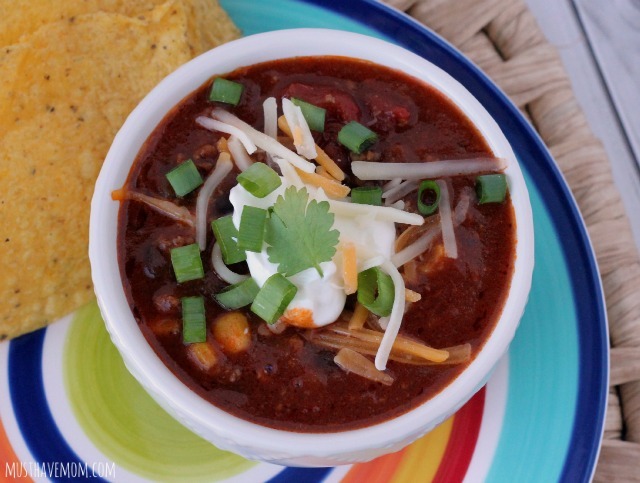 I used the Mexican Style Tomato soup in this recipe which added great flavor to the taco soup. 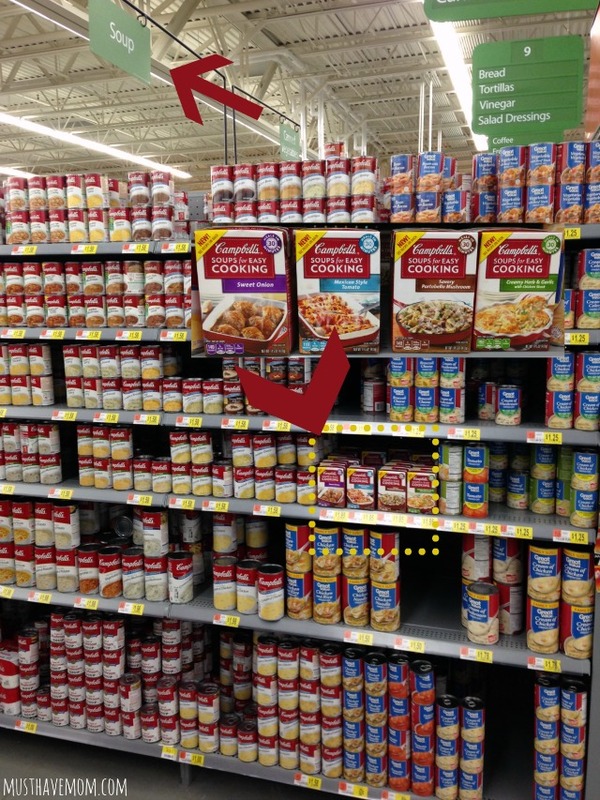 If you haven’t seen the new Campbell’s Soups for Easy Cooking yet, you will find them in the soup aisle next to the canned soup. They are about the same height as a soup can so they blend in easily with the rest of the soups. You can see them above. If you know what you are looking for they are easy to spot! You can grab a $.75 coupon on Walmart.com that is valid for one month! 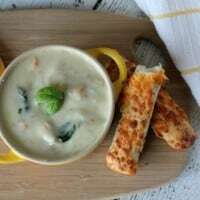 That coupon makes these soups very inexpensive so make sure you take advantage of it! In a large pot brown 2 pounds of ground beef and half an onion, diced into small pieces. Drain fat and return beef to pot. 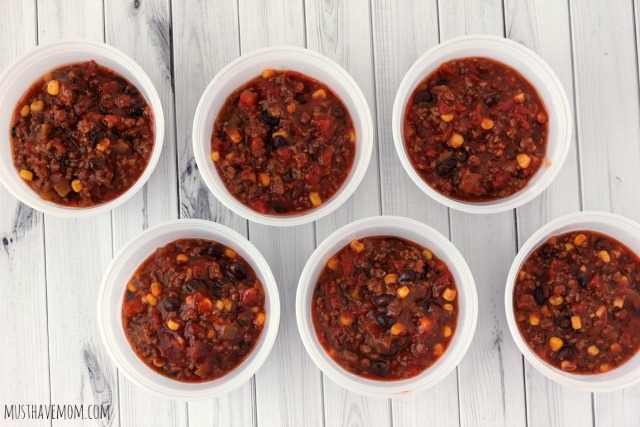 Then add 2 cartons of Campbell’s Mexican Style Tomato soup, 15 oz can of stewed tomatoes, 2 (14.5 oz) cans petite diced tomatoes in tomato juice, 1 cup water, 1 (15 oz) can black beans, 1 (15 oz) can corn, 2 envelopes of taco seasoning, 1/2 tsp cumin, and 1 small can of green chilies to pot. Stir to mix well and heat to a boil. Simmer for five minutes until warmed throughout. That’s it! This soup is ready in under 30 minutes and is such a hearty, filling meal. Serve with tortilla chips or corn chips. Top with sour cream, shredded cheese, green onions, or avocado. This was my first time cooking with the new Campbell’s Soups for Easy Cooking and I really love how quickly it makes meal preparation. They have four varieties that are perfect for replacing condensed soups in your recipes to make for faster meal preparation. Try replacing your Cream of Mushroom with the Savory Portobello Mushroom in your recipe (great for skillet recipes). 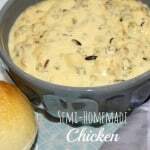 The Creamy Herb & Garlic with Chicken Stock Cream of Chicken is a great replacement for Cream of Chicken soup. Replace your Condensed French Onion Soup with the savory Sweet Onion flavor (this a savory addition to any meatloaf and skillet dishes). The Mexican Style Tomato which I used in this recipe is great for any Mexican dishes! Follow Campbell’s on Facebook, Twitter and Pinterest to find more easy weeknight recipes you can make in 30 minutes! This recipe makes ten servings. If your family is smaller than that you can freeze the rest of the soup and reheat it for a quick, easy lunch later. I LOVE freezing soups so that I always have a quick lunch on hand when I need it. It beats eating pizza or mac ‘n cheese with the kids everyday! I freeze my soups in these freezer containers that are meant to be frozen and are also safe to microwave. When you are ready to eat just thaw it and heat it up in the microwave or on the stove. Pin this recipe for later and print it off below! 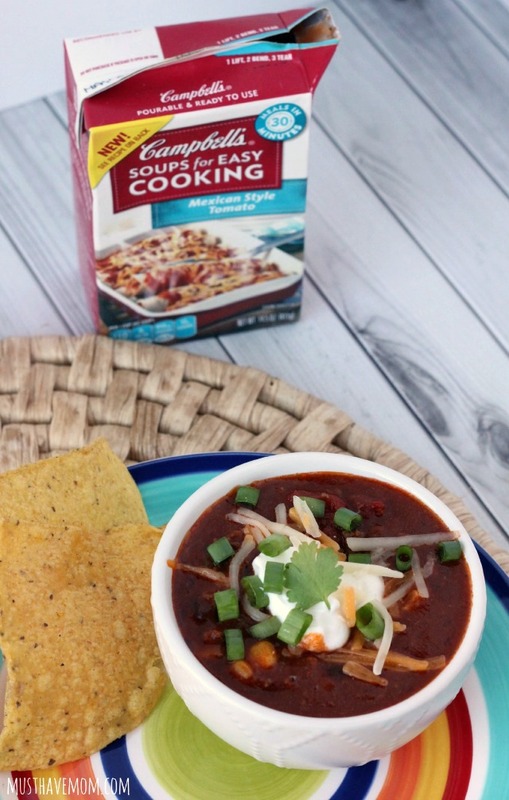 Hearty taco soup that is ready in under 30 minutes and also freezes well! In a large pot brown onions and beef until no longer pink. Drain fat and return to pot. Add remaining ingredients to the pot and stir to mix well. Heat to a boil over medium high heat and then simmer for 5 minutes. Optional: Garnish with shredded cheese, sour cream, avocado, chopped tomato, green onions. Serve with tortilla chips or corn chips. 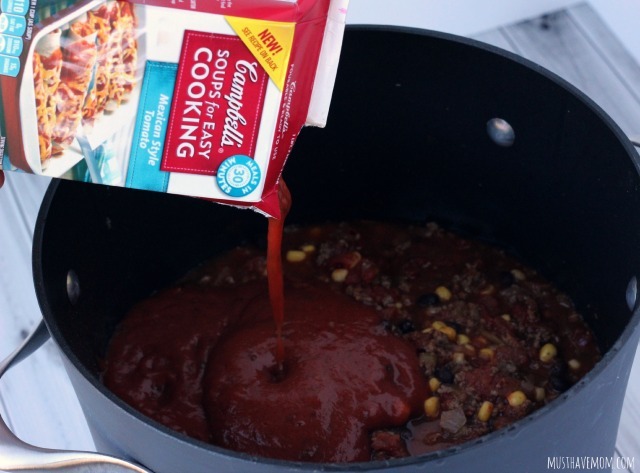 Be sure to check out more delicious, easy homemade recipes using Campbell’s Soups for Easy Cooking at http://cbi.as/4pdn! I’d love to hear your favorite! « Easy Easter Bunny Pudding Cups & Easter “Carrots”! I hear ya. My evenings are so crazy sometimes it’s hard to cook a home cooked healthy meal. I love that this takes only 30 minutes. Will have to try this recipe. Delicious! I love cities that are hearty enough to be a full meal. We would love to have this for lunch. Taco soup is one of my favorites. It reminds me of summertime and baseball. We love all things mexican! And this is such an easy recipe – thanks. This looks really good. I love taco soup and this Campbells soup starter looks like it would add nice flavor to a soup! I’m a fan of Campbells!!! It’s my go–to dinner when I’m busy at work! I am with you on that. 30 minutes or less meals is something I try to do often. We have such busy schedules that these meals come in handy. One of my family’s favourite meals! This is so quick and easy to make. I prefer making homemade broth but when I don’t have the ingredients or time, I always go for Campbells! That’s sound so easy to make and I love the 30 minutes cooking time. I surely need to kind of recipe in my busy days. 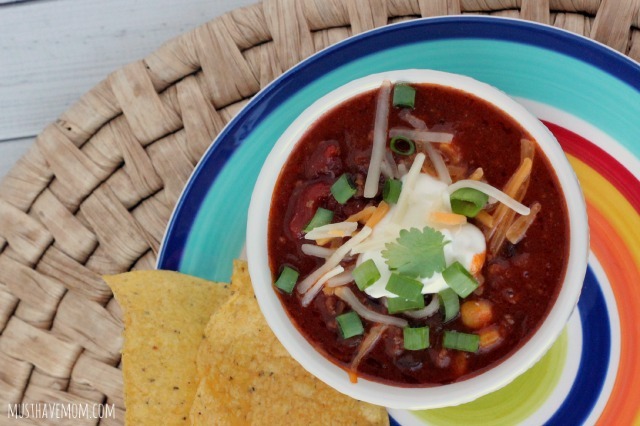 I have never tried making taco soup so thank you for sharing this recipe. I might make this tonight since we are having a freezing temperature (17 degrees right now). Freezing on Spring isn’t fun! Ugh I agree! We just had the same weather. It was nice today but it is supposed to snow again tonight! Such an odd Spring! This looks so delicious. It is such a cold day here today. I would love to warm up with a bowl of this fantastic soup. One of my favorite soups would be a spicy tortilla. This looks so yummy and made simple by using the ready made stock. I have to agree, I love a spicy chicken tortilla soup! Yum! This looks super tasty! I love that it’s quick to make too! 30 mins is amazing! That’s a great sounding soup! I’d like to try that one here, I know the teen and hubs would love it. I would give anything for a hot bowl of soup right now and I absolutely love anything taco!!! Yum, yum! Thanks for the recipe! That looks really tasty! It would really be good to have on a cold night, or any night for that matter! Isn’t it convenient to have it stocked up in the freezer?! 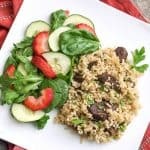 I love quick and easy recipes! It’s perfect for busy moms. Thanks for sharing. 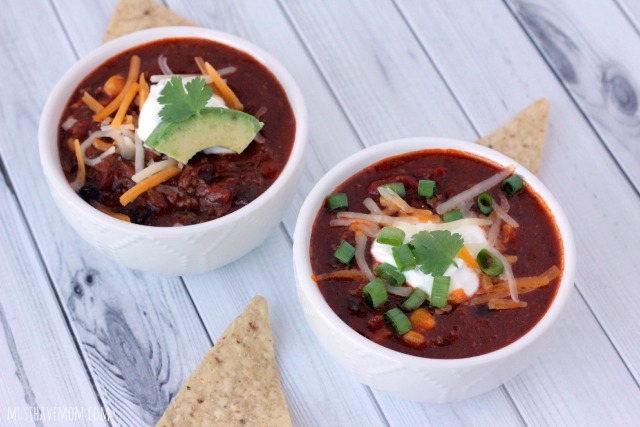 Omgoodness you have combined two of my favorite things… MEXICAN FOOD AND MAKING SOUPS! I have never seen the Campbell’s Mexican Tomato Soup but I bet it’s yummy! Adding in the beans, corn and others sounds amazing! Thanks, I will be looking for this ASAP! 2 of my favorite things too Krysta! That does look incredibly tasty! We made an unstuffed sausage and pepper soup the other night with similar ingredients. I’ve never tried taco with soup, I’ll try it because yours is really look yummy and tasty. Thanks Angela! Let me know what you think! yum. looks like a meal that everyone will love! I love the soup in cartons! IT’s better for the environment and easier to dispose of! How delicious! It has been ages since I have made taco soup, but it is definitely one of my favorites. I agree: anything that takes less time on a Mommy schedule for dinner is simply a blessing! Thank you for sharing! We just picked up several boxes of these but haven’t tried any yet. Good to know there are some great recipe ideas out there for them. Glad to hear it! Let me know what you think. 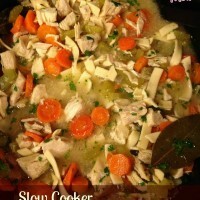 This is a great recipe, This is always my go to on a busy weeknight for the family. After a busy day at work and then blogging, I would love to be able to make a thirty minute meal. I have never had taco soup, but love tacos enough to want to give this a true. Campbell rarely gets it wrong. I have never tried the Campbell soups for cooking before but I am going to have to try this recipe. It sounds and looks interesting indeed. Thanks for shairng. I love anything that says it is tacos! I think your 30 minute Taco soup is amazing and I will have to make it. I do not like making recipes that take a long time! Quick recipes are such a blessing on busy days.